Satellites are built to endure decades in the most inhospitable conditions in the known universe. Paradoxically, engineers are now trying to figure out how to design them so that they do melt—planned obsolescence at 200 miles above the Earth. The problem with satellite design is that it’s almost too good; these incredibly big, incredibly heavy devices are designed to survive huge g-forces, extreme heat, and extreme cold. That’s kept many of them operating (or at least orbiting) well beyond the end of their planned lifespans, in some cases for more than 50 years. Vanguard 1, the oldest satellite in orbit today, was launched all the way back in 1964. What’s the problem with super-tough satellites (and rocket parts, for that matter)? For one thing, it’s crowded up there. Old satellites and discarded parts pose a major threat to spacecraft that are still in operation (not to mention the ISS). 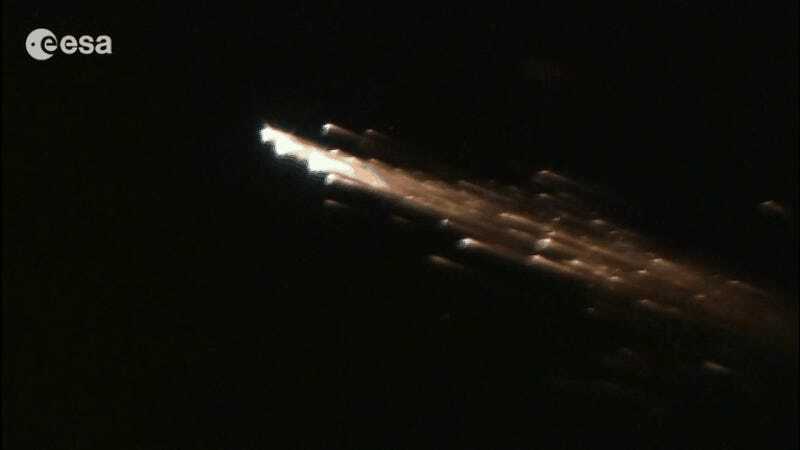 If a satellite’s orbit does degrade and it reenters Earth’s atmosphere, it doesn’t always burn up completely—hence huge chunks of metal falling back to Earth, which happens with some regularity. A Delta 2 third stage–a titanium motor casing–reentered and landed in Saudi Arabia in 2001. NASA. Bottom: A “pressurization sphere” that once was part of a rocket fell to Earth in Southern Africa. NASA. What’s to be done, though? How can you design a device to endure extreme conditions, then plan its destruction by those same conditions? Very, very carefully, with many, many tests, as the European Space Agency explained this week in a fascinating post. The ESA calls this idea “Design for Destruction,” or D4D, a project that’s part of the three-year-old Clean Space Initiative. The project is part of an emerging idea in aerospace design that seeks to leave less of an impact on the crowded environment of orbits around Earth—an epoch that has parallels here on Earth in the movement towards biodegradable plastics and other low-impact materials. Top: The planned breakup of the Jules Verne ATV. ESA. Bottom: A propellant tank that fell to Earth in Georgetown, Texas, in 1997. NASA. The first order of business on the D4D list? 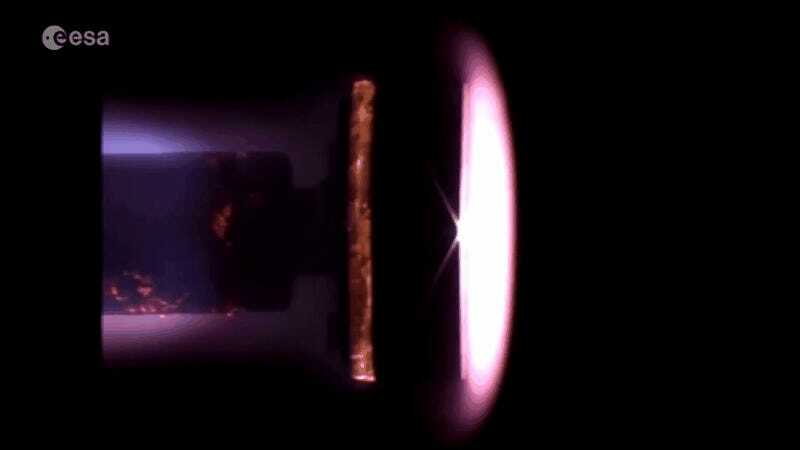 Develop materials that will melt in specific ways when exposed to the intense heat of reentry. For example, Tiago Soares, a system engineer on the project, explained that composite carbon fiber panels tend to melt surprisingly slowly because of the resin used to bind the fibers. But that won’t be enough. As Soares says in the post, “even redesigned parts will not melt if they are not exposed to the searing heat early enough.” So the team is looking at how to “open up” the body of satellites “as early as possible during reentry,” instead. Imagine a satellite design that includes a self-destruct mode; at the end of its useful life, as it degrades towards its fiery end, it might disassemble or reorient some of its thousands of distinct parts and panels so that they’re fully exposed to the heat of reentry, ensuring they melt completely. We’re living in the Anthropocene, the geological epoch defined by human civilization altering the planet completely. In a way, the same is true for the space around the Earth, clogged with our machines. Figuring out a way to mitigate our footprint is the primary challenge of the future—and, as D4D demonstrates, that ethos even extends to space.